February 20, 2011 by Alphageek in "alphageek bourbon jim beam black"
It is Presidents Day here at Alpageek's Thoughts, and in honor of great Americans I decided to talk a little about a great American tradition, bourbon. If you have been following things around here, it has not been hard to do. The posts have dropped off as other projects are beginning to take form, and the this web site has taken a hit. While I can't promise we will start to pump out the all original content really quickly again, I can promise a short write up about a bourbon I tried, and enjoyed. Why did I try this bourbon? It was actually very simple. 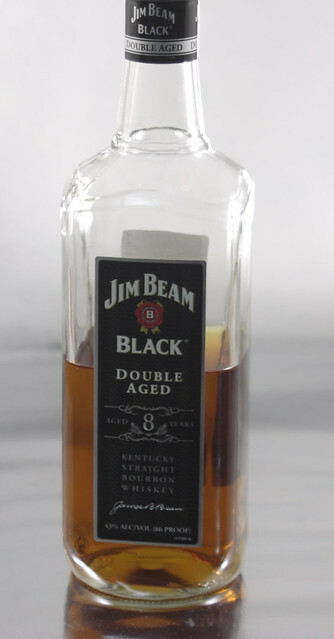 The first is that I have never had Jim Beam Black, Double Aged. I don't know what Double Aged means. Remember, all original content? You should just google the term, and then you will know. I am really not that interested in a term that may or may not mean something. The second reason is almost embarrassing: I could not find my small flask that I have for special occasions. Mrs. Alphageek said I should buy the bourbon and try it. Something free is always nice too. I decided to have a little sip while I was watching Bladerunner. Bladerunner is a great movie to have a small drink while watching. You think "I can't possibly drink as much as Deckard" and you don't feel guilty for having a sip while you contemplate, yet again, if Deckard is a human, or a replicant. I wonder if anyone has ever used the reason Deckard drinks like a fish to support the argument that he is a replicant? There is another original thought today! I did not have any expectations when I poured a small drink for myself. I took one sip and was pleasantly surprised! I don't know if Double Aged means that the bourbon is smooth and mellow, but that would be how I would describe this unexpected find. I get a small hint of oak to go with the mellowness. While it is not the most complex bourbon I have ever had, the smooth character makes for an enjoyable drink. This is yet another bourbon that I can fully recommend. Give it a try, and let me know what you think. I think the free flask offer is over. "alphageek bourbon jim beam black"